A three-phase contactor is an electronic device used to turn power on or off at a three-phase load. These devices are used when the voltage requirements of the load exceed the power-handling capability of a mechanical relay. Contactors are typically used on three-phase air conditioning motors requiring at least 480 volts to operate. These devices do not use a physical switch for switching. A contactor uses a low-voltage signal to control the high-voltage circuit. This low-voltage signal can be controlled by an electrical relay or a computer. Shut off the power to the three-phase load. Depending on the voltage level of the circuit, the wire colors will be different. A three phase load is powered by three power wires. For some AC circuits the colors will be black, red, and blue. 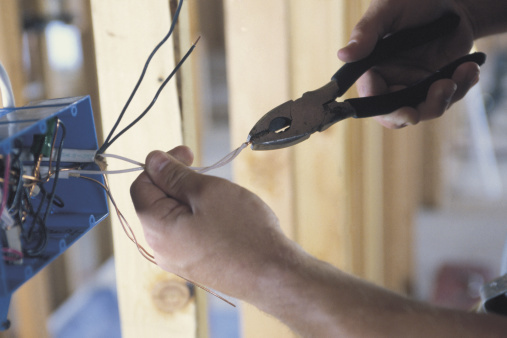 Disconnect these three power wires at the load using a screwdriver or socket wrench. Connect the black, red, and blue power wires to the contactor terminals L1, L2, and L3 respectively. This step connects your power source to the line input side of the contactor. Take additional black, red, and blue three-phase wire that is the same size as the supply wires and connect one end of these wires to the T1, T2, and T3 terminals on the contactor. T1, T2, and T3 represent the load side of the contactor. Connect the other end of these wires to the power terminals of the load. This step connects the contactor to the load. Connect the control circuit to the positive and negative control terminals of the contactor. Turn the power back on and test the contactor operation by turning the load on and then shut it off using the control circuit.